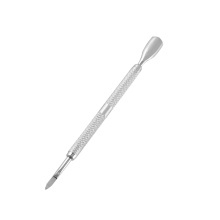 Dual-end nail pusher for pushing and cutting nail cuticle. Ergonomic design and anti-slip handle, safe to use. It can help you push cuticle back and trim your dead skin near your nails. It will become an useful tool for nail trimming. Made of good quality stainless steel, sturdy enough and not easy to rust. Double-ended design, one tool contains 2 different sides, meeting your different needs. Can be used to push cuticle back and trim dead skin near your nails. Also great for cleaning under nail cuticle or dirt and removing glue when using acrylic nails. Ergonomic design and non-slip handle, comfortable and easy to use.